I will admit that I’m not a car guy. I take care of minor maintenance; gas, washer fluid, bulbs, etc. I rarely wash my car and take it to get oil changes and tune-ups a little too infrequently to be honest. So fast forward to earlier this week, the car had been running rough for a few weeks AND it was time to fill up (based on the warning light). We’re freshly back from vacation and now the things I put off (which I planned to do before we left) are more than overdue to be resolved. I finally drug myself into the “kwik” place to get my oil changed. I expected them to find something since I hadn’t done as good by my car as I should, but I got away with only an oil change and a new air filter. I didn’t get gas though; I was too tired and figured I could get it the next morning. Next morning, on the move I had no time for gas again and said to myself, “I’ll get some this evening”. Well, evening came and I was on the road to head to the gas station… then the warning light goes off. At that moment I had several choices that needed to be made that would determine my future and the likelihood of making it to where I needed to go–to the gas station. 2. I’m letting down my windows and shutting off the A/C (I need to check myth busters to see if that actually works). Did I mention it was over 100 degrees? 3. I’m not putting myself in this position anymore. The inconvenience of walking miles to the gas station is far more than the inconvenience of stopping by the station with half a tank of gas on a busy day. I was willing to go through a little discomfort to make it to my destination. What is debt freedom worth to you? Giving up eating out for a while? Taking an extra job (or two)? Selling some stuff? Riding the bus? To get to the position of financial empowerment, many will face discomfort. When I speak to groups I often say, “If you are hurting anyway, hurt while working toward something.” Why just hurt and struggle to pay bills? I passed up other convenience stores (options) to get to the store I knew was open. This was actually a risky thing that I did; I went to what was comfortable. I ‘knew’ the station not too far from my home was never busy (I was afraid I’d have to wait in line somewhere else), and I was just unsure the other signs I saw from the freeway were for stations that were potentially closed, full, or whatever. In times of stress, we go back to what’s comfortable, this happens in many areas of life. I suggest you pass up those comfortable options; credit cleaning services, payday loans, lottery, and the like, and try a proven process to win. We just happen to know that process. 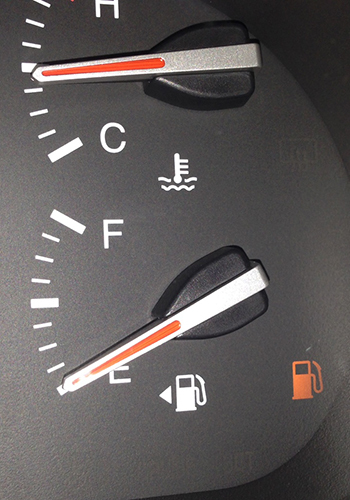 I constantly monitored my gas gauge (to know where I stood). Do you really know where you stand financially? Based on statistics, most reading this post do not. How can you improve or strengthen something without knowing where it presently stands? Just knowing where you stand will help you develop a plan for where you want to go. We can help you with that, and have resources to support you. I got into this position by being lazy (I was just too tired to do it then I kept putting it off), which didn’t change the situation; it only made it more critical to take care of. Your financial situation is not going to fix itself; you have to take charge of it. You need to have a “Sick and Tired” moment and move to make the changes needed to be financially empowered. Watch your spending, save for rainy days, budget. Plan for birthdays, Christmas and travel and commit to making these things cash-only expenses. I hope this little story helped you. Drop by our free resources page to help you figure out where you stand financially, set up a rainy day fund, budget, save for purchases, and more.